A new opioid use disorder program is now available through primary care clinics at UHealth – the University of Miami Health System. Patients receive confidential medication-assisted treatment and are connected with UHealth specialty care providers, and other health and social services as needed. “We now offer a medication-assisted treatment program that has shown to be highly effective in treating opioid addictions,” said Viviana E. Horigian, M.D., associate professor of public health sciences and researcher in the Department of Public Health Sciences at UM’s Miller School of Medicine. The Miller School’s Department of Family Medicine and the Department of Medicine’s Division of Internal Medicine recently implemented an Office-Based Addiction Treatment (OBAT) program at two primary care clinics at the Professional Arts Center on the medical campus. The UHealth OBAT team’s dedicated medical professionals specialize in the treatment of opiate use disorder. A nurse care manager oversees a patient’s opiate use disorder in the same way other chronic health conditions are managed in primary care. 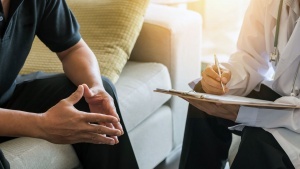 Patients receive confidential medication-assisted treatment with buprenorphine or naltrexone and are connected with UHealth specialty care providers and other health and social services as needed. 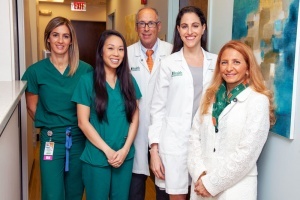 From left, Jessica J. Gonzalez, BS, RN, Melissa Chee, BSN, RN-BC, E. Robert Schwartz, M.D., Lainey Kieffer, D.N.P., ARNP, FNP-BC, and Viviana E. Horigian, M.D. Dr. Horigian has long been an advocate for better national surveillance and reporting on the national opioid epidemic, which claims about 175 lives every day. Expanding access to medication-assisted treatment and risk-reduction programs, such as clean syringe exchange programs, can play an important role in reducing the death toll. The UHealth program is based on the Massachusetts Model developed by Boston Medical Center in the early 2000s. This nationally recognized OBAT program serves as a model for facilitating access to lifesaving treatment and improving treatment outcomes in patients with opioid use disorders. To refer a patient to the UHealth OBAT program or schedule an appointment, call 305-243-8523.